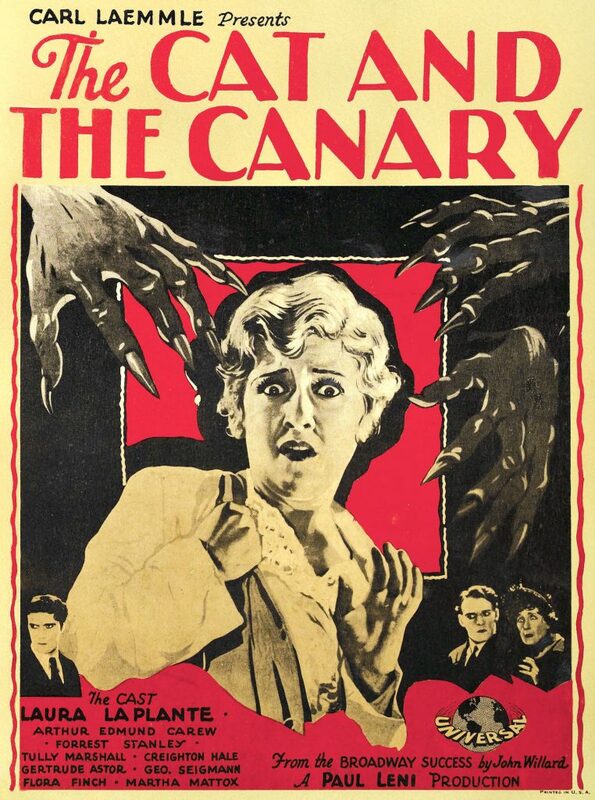 The Cat and the Canary is a 1927 American silent horror film adaptation of John Willard’s 1922 black comedy play of the same name. Directed by German Expressionist filmmaker Paul Leni, the film stars Laura La Plante as Annabelle West, Forrest Stanley as Charles “Charlie” Wilder, and Creighton Hale as Paul Jones. The plot revolves around the death of Cyrus West, who is Annabelle, Charlie, and Paul’s uncle, and the reading of his will 20 years later. Annabelle inherits her uncle’s fortune, but when she and her family spend the night in his haunted mansion they are stalked by a mysterious figure. Meanwhile, a lunatic known as “the Cat” escapes from an asylum and hides in the mansion. The film is part of a genre of comedy horror films inspired by 1920s Broadway stage plays. Paul Leni’s adaptation of Willard’s play blended expressionism with humor, a style Leni was notable for and critics recognized as unique. Leni’s style of directing made The Cat and the Canary influential in the “old dark house” genre of films popular from the 1930s through the 1950s. The film was one of Universal’s early horror productions and is considered “the cornerstone of Universal’s school of horror.” The play has been filmed five other times, with the most notable in 1939 starring comedic actor Bob Hope and Paulette Goddard. In a decaying mansion overlooking the Hudson River, millionaire Cyrus West approaches death. His greedy family descends upon him like “cats around a canary”, causing him to become insane. West orders that his last will and testament remain locked in a safe and go unread until the 20th anniversary of his death. As the appointed time arrives, West’s lawyer, Roger Crosby (Tully Marshall), discovers that a second will mysteriously appeared in the safe. The second will may only be opened if the terms of the first will are not fulfilled. The caretaker of the West mansion, Mammy Pleasant (Martha Mattox), blames the manifestation of the second will on the ghost of Cyrus West, a notion that the astonished Crosby quickly rejects. While the family prepares for dinner, a guard (George Siegmann) barges in and announces that an escaped lunatic called the Cat is either in the house or on the grounds. The guard tells Cecily, “He’s a maniac who thinks he’s a cat, and tears his victims like they were canaries!” Meanwhile, Crosby suspects someone in the family might try to harm Annabelle and decides to inform her of her successor. Before he speaks the person’s name, a hairy hand with long nails emerges from a secret passage in a bookshelf and pulls him in, terrifying Annabelle. When she explains what happened to Crosby, the family immediately concludes that she is insane. Alone in her assigned room, Annabelle examines a note slipped to her which reveals the location of the family jewels, fashioned into an elaborate necklace. She follows the note’s instructions and soon discovers the hiding place, in a secret panel above the fireplace. She retires for the night, wearing the diamond-encrusted necklace and begins to toss and turn. While Annabelle sleeps, the same mysterious hand emerges from the wall behind her bed and snatches the diamonds from her neck. Once again, her sanity is questioned, but as Harry and Annabelle search the room, they discover a hidden passage in the wall and in it the corpse of Roger Crosby. Mammy Pleasant leaves to call the police, while Harry searches for the guard; Susan runs away in hysterics and hitches a ride with a milkman (Joe Murphy). Paul and Annabelle return to her room to search for the missing envelope, and discover that Crosby’s body is missing. Paul vanishes as the secret passage closes behind him. Wandering in the hidden passages, Paul is attacked by the Cat and left for dead. He regains consciousness in time to rescue Annabelle. The police arrive and arrest the Cat, who is Charlie Wilder in disguise; the guard is his accomplice. Wilder is the person named in the second will; he hoped to drive Annabelle insane so that he could receive the inheritance.